Evening sky as seen facing west in Adelaide at 9:00 pm ACST, December 31. Similar views will be seen elsewhere in Australia at similar local times. 2009 is almost upon us, but 2008 has one last beautiful astronomical view for us. 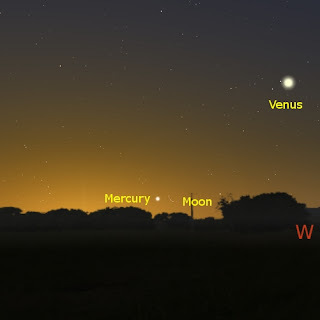 The thin crescent Moon will be near Venus, with Mercury and Jupiter close by each other. This will be a very attractive start to the New Years Eve festivities. So have fun everybody, stay safe, and if you are up late enough you can look at Saturn rising in the early morning sky. See you all in 2009. Well, at least I'm up there. Hey, I got listed in the Top 100 Space and Astronomy Blogs. Okay, so I'm number 82, but I'm there. Actually the numbers don't mean a heck of a lot as they sort of represent the top 10 in 10 different themes (Bad Astronomy comes in at number 44, but is really number 1 in "Space Professionals"). Lots of friends are there, Stuart's, DaveP's and Tom's astronomy blogs are featured for example (as are most of the contributors to Carnival of Space). In fact, this list would be ideal as astronomy bookmarks, although I was surprised to see Top of the Lawn missing. 8:30 pm: Sunset in two minutes, occultation begins in 7 minutes, I can see Venus clearly, but the Moon is still invisible to both the unaided eye and binoculars. The rellies are having a BBQ, and are listening to Splendor in the Grass at full volume on triple J as the shasliks cook. 8:45 pm: At a few minutes before occultation, I pick up the Moon and Jupiter as pale ghosts in binoculars. I jiggle the scope around and finally get the Moon and Jupiter in the scope. SmallestOne asks if he can see the Moon. I look up, then look back and Jupiter is gone! Blast. 9:00 pm - 9:20 pm: Show the kids the Moon through the scope, eat delicious barbecue with rellies (brother-in-law #1 got a potato cookbook for Christmas, we had Swedish baked potatoes and Oyster blade cooked on the Barbie with hot pepper sauce). 9:25 pm: Jog (as much as you can jog carrying a 4" reflector telescope) up the the end of the street to get the Moon clear of obstructions. Align scope and get Moon focused. 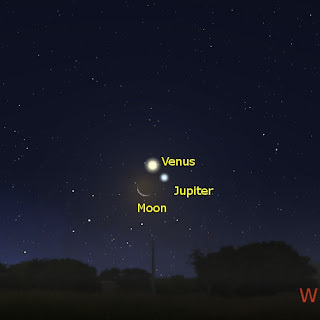 Looking at wrong end of the Moon when Jupiter appears (Skymap had the Moon appearing further along the northern limb). Watch Jupiter slowly emerge above the craters of the thin crescent Moon. Astounding sight. Even with the Moon and Jupiter low to the horizon, you can still see it all fairly clearly. Take rubbish photo (discover settings jogged onto "automatic bright daylight", rather than my astronomy setup while carrying scope up street). Neighbour arrives up and has a look through the scope at Jupiter pulling away from the moon, is impressed. Try and get wide field shot with camera, shakes too much in wind from sea. 10:00 pm: Get back to house in time for Brother-in-law #2's Birthday cake. No one cares about occultation. Eat outrageous amount of cake and listen to Leonard Cohen at unreasonable volume. (as usual click on any of the images for a larger version, the bottom image has Mercury visible just near the trees. Occultation of Jupiter, 29 December, 2008). You may be familiar with red/(cyan or blue) anaglyphs. These are pictures where a 3D effect is produced by overlapping red and cyan (or blue) images. I have used anaglyphs to make stereo images of Mars and the Sun, for example. A couple of days ago MiddleOne asked if you could draw 3D pictures. I thought it was possible from my experience with anaglyphs, and we experimented with various coloured textas, but with only minor successs. Around 5:30 this morning SmallestOne kicked me out of bed, and I started thinking (or maybe I was already dreaming) about anaglyphs. I couldn't go back to sleep, so I tried experimenting. First you need the right colour textas. Our stereo glasses have red for the left eye, and cyan for the right eye. You need a red colour that will be invisible through the left eye, and dark through the right eye, and a blue/green that is invisible through the right eye and dark in the left eye. It was pretty easy to find a light red text that fitted the bill (our previous attempts had used too dark a red). Finding a blue-green that worked was much harder, and I had to settle for a pale green/blue that sort of worked. Once you have your colours, then how do you match them up to give depth? I started with simple squares. 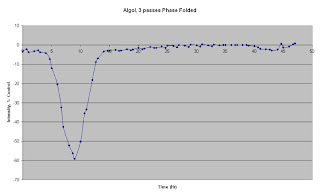 Blue-green lines to the left of the red lines make the boxes appeare below the picture plane, blue-green to the right makes the boxes appear above the picture plane. The wider the lines apart, the greater the feeling of depth. by grading the line spacing, you can give a feeling of volume to the surface. You also have to choose your viewing postion, straight up and down at about a meter away works best. 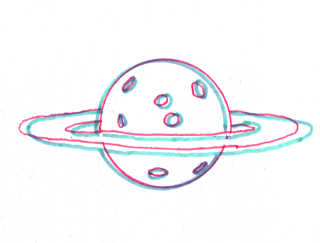 The planet with craters and rings above is the result. Viewing with red/cyan glasses about a meter away gives a nice 3D effect for the cratered body of the planet. The rings are a little wobbly though, but still, this was a hand drawn image using only red and blue-green textas. A little practise (and a better shade of blue-green), and you can draw stunning 3D images without fancy computer graphics programs. The western horizon as seen from Adelaide at 9:00 pm ACDST. Jupiter is behind the Moon. Jupiter passes behind the Moon on Monday, December 29 2008. Occultations of bright planets, especially Jupiter, are both relatively rare (from any given spot on earth) and quite lovely. With the Moon being a thin crescent, Mercury right next to it and Venus bright up above, this will be a spectacular occultation. That's the good news, the bad news is that the occultation occurs soon after Sunset. So for most sites (except Western Australia, where Jupiter goes behind the Moon before Sunset), Jupiter passes behind the Moon when the sky is still bright. This will be near impossible to see with the unaided eye, but will be easily visible in binoculars or a telescope. The exit of Jupiter from behind the bright crescent of the Moon occurs when the sky is reasonably dark (except in WA, where the sky is still quite bright), but when the Moon is quite low to the horizon, so you will need a fairly level, unobstructed horizon to see Jupiter emerge. Still, while the conditions are quite difficult, the effort is well worth it. 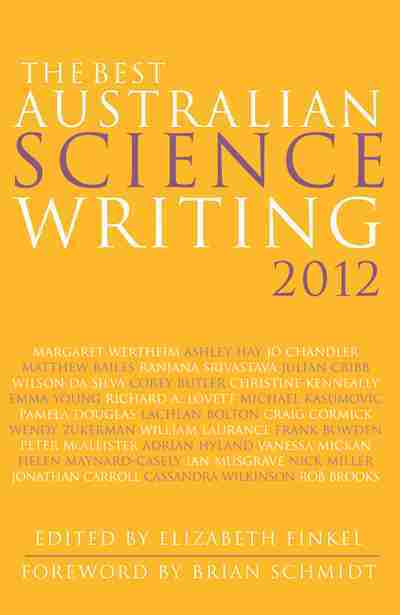 The occultation is best from South Eastern Australia, with most of Queensland and northern New South Wales missing out. A table with times for representative cities is here at Southern Skywatch. 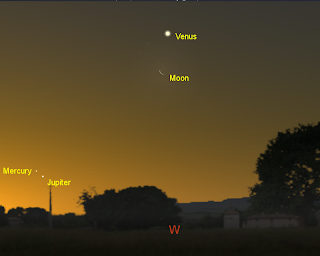 Strictly speaking, both Sydney and Darwin (shown as misses) see Jupiter go behind the Moon, but at only a few degrees above the horizon under twilight skies this will be very difficult to see. A fuller list of cities and times (in Universal Time), and a diagram of the occultation path is at the International Occultation Timing Site. So good luck and clear skies for the occultation night! 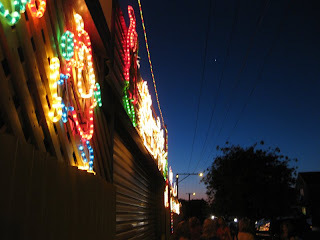 Venus shines above the Christmas decorations down the street from us. Merry Christmas, Happy Sun-return Festival, Happy New Year, and here's hoping you are all safe from the loonies on the roads this festive season. Remember comet P/2003 K2 (P/2008 X4) Christensen? Well it has crossed the field of view of the LASCO C3 camera of the SOHO spacecraft. At the time of writing it has gone behind the occulting disk, and has not yet reappeared. The image to the left was taken on the 22nd at around 19h UT, the comet is indicated with a short line. You can download the latest video from SOHO here (but its 7 Mb and you need to look carefully at the last few frames) or you can download my AVI here (only 0.5 Mb). Christmas is coming! 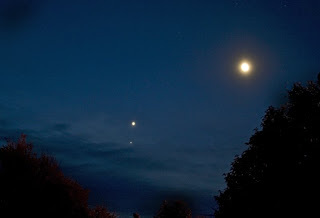 As well as the traditional roast animals, plum pudding and hot cocoa (which in Australia is a bit weird, as it's hot and sunny here), you will get to see a nice line-up of Venus, Jupiter and Mercury. 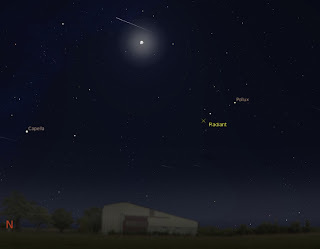 The image to the left is the evening sky around 9:00 am local time in Australia on December 25. 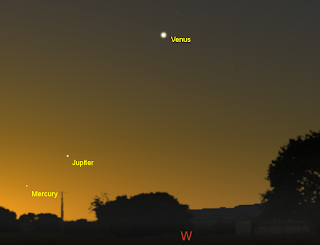 Jupiter and Mercury are close in the twilight, and Venus glows above. This will be a fine accompaniment to pre-dinner drinks or cracker pulling on Christmas evening. As the days roll on, it gets better. Mercury and Jupiter come closer together, cumulating on the 29th with the occulatation of Jupiter, where the Moon passes in front of Jupiter, with Mercury nearby. This is Australia specific, New Zealand and most of South Asia will see Mercury, the Moon and Jupiter very close together, and South Africa will see them strung out in a line. Still very beautiful, and well worth watching though. On the 31st the crescent Moon is very close to Venus, and Jupiter and Mercury are at their closest, a fine evening sight to herald in the New Year, and the International Year of Astronomy. My posts will be a bit spotty now, with lots of relatives visiting, and food to cook and eat. So have a Merry and safe holdiay season, watch out for loonies on the road, and clear skies! Carnival of Space #84 is now up. Carnival of Space #84 is now up at the Next Big Future. There is news on the space exploration crisis, the suopercritical ocean on Venus, the top 10 best astrophotographs, lots more on Mars, engaging children in space Science and lots, lots more. So put on yur best space suit and head on over. While I'm on the subject of useful programs for amateur astronomy, Google earth has a number of useful features. 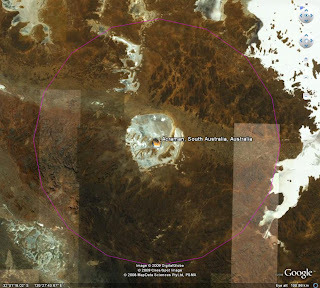 You can get databases of impact structures (such as the Arcaman crater in South Australia pictures). There is also a more extensvie database maintained by the Impact Field Studies Group. In a previous post I gave links to Celestia SSC files you could download in order to see C/2003 K2 Christensen from the point of view of the STEREO space craft (and Earth). But what happens if a new comet appears and you want to see where that is in Celestia (and from the POV of the STEREO spacecraft)? Well, you could wait for me to make an SSC file for that comet and post it, or you could make your own. How can you make your own SSC files? First off you can ignore everything under InfoURL, they are made up figures as newly discovered comets will not have this data. All you really need is the orbital elements, so where do you get these? From the Minor Planet Center, where else? Now, you can get them in three ways, if the comet is really recent, you can look up the Minor Planet Electronic Circular. Otherwise, you can use either the Orbital elements of comets page, or you can use the Minor Planet Comet and Ephemeris Service. As a demonstration, I'll use the Ephemeris service. 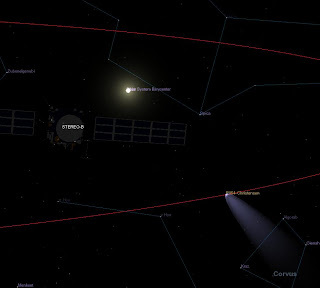 After clicking on the ephemeris service link, scroll down and type your comet in the box (use P/2008 X4 for this demonstration), then scroll down the Ephemeris Options below, ignoring all except the "Also display elements for epoch" box. Type the current date in there using year-month-day format 2008-12-18 (see image above, click image to enlarge). 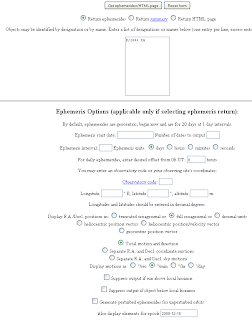 Ignore everything else and click on the Get Ephemeris button. So Epoch = Epoch, that's clear UPDATE: No it's not, Epoch actually means Julian date of perihelion (that's why I had to use the second of the two dates). Except for P/2008 X4 I had to use the second of the two Epoch dates to get the comet in the right place. Peri = ArgOfPericentre, Node = Ascending node, Incl = Inclination(so far so good), e? what the heck is e? e= eccentricity (hey obvious), q = PericenterDistance (only Celestia uses Pericenter, everyone else uses Perihelion), ignore a and use 0.0 for mean anomaly. Where is the Period you ask? Good question, it's not there. But see the link up the top? Perturbed ephemeris below is based on elements from MPEC 2008-X81. Click on the hyperlink, scroll down and just before the residuals you will find P 5.66. This is the period. This won't work for all comets, the old, established comets don't have that link but new ones will (obviously the name of the link will be different for other comets). Alternatively you can use the JPL Horizons system (a PDF tutorial on using the system is here) In the JPL Horizons system Epoch=Epoch W = ArgOfPericentre, OM = Ascending node, IN = Inclination, EC= eccentricity, QR = PericenterDistance, PER= period and MA= mean anomoly (when given). However, the JPL Horizons system currently gives the WRONG orbital elements for P/2008 X4, it uses the old P/2003 K2 elements, which is why I didn't go there in the first place. If you are lucky your comet will be listed in Wikipedia (here is a list of all currently known period comets, but without C/2008 X4). For known comets that aren't currently included in the Celestia main download, go to the Celestia Motherload comets page. There is a full catalog of periodic comets there (minus P/2008 X4 of course), but if you download that into extras and turn the orbits on, you won't see a thing for comet orbits. It may be best if you store this file somewhere else and extract comets as you need them. Selden Ball has a list of instructions for converting MPC elements to Celestia format which is mots helpful (and also helps with other formats like the JPL Horizons format). He also has a neat list of Celestia resources which you might like. Lots of people are examining their images of the "Night of the Smiley Fritz" and M55 to see if they unexpectedly caught comet C/2003 K2 (C/2008 X4) Christensen. This is Comet Al's image from that night. The comet should have been in the boxed area (the top part is a StarryNight image showing the comets orbit). A bit longer exposure and he might have got it. Lots of other people are finding that the comet was just outside the frame. Soooo close! So keep searching your images folks, you might just find it. This image is comet C/2003 K2 (also designated C/2008 X4) Christensen as seen from the spacecraft STEREO B on December 8. This comet was recently recovered by Comet Al from images taken by the STEREO B spacecraft on that date. I made this image using the 3D space simulation program Celestia. If you would like to do something similar, I have created .ssc files for the two stereo spacecraft which can be obtained here. and an .ssc file for C/2003 K2 (C/2008 X4) using the latest orbit data (.ssc here, latest orbit data here). The comet is designated 164P-Christensen, and can be found in the solar system browser (or search on 164P). Just download these files into the extras folder of Celestia and you are ready to go (despite the comet only being magnitude 10, Celestia exagerates the comets tail and brightness, it does this for all comets around perihelion, but it makes them easy to find). You can get a whole passel of comet orbitals from the Celestia motherlode comet section, but be aware that the 164P-Christensen obits here are the old, pre-recovery orbits (also, if you load in the full catalog of comets, they sky will be taken up by comet orbits, best to use that as a resource to extract comets as you need them). 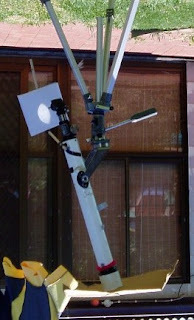 Celestia is not just a pretty picture maker, but by using it to view the sky form the point of view of the STEREO spacecraft, you can use it to identify objects seen in STEREO pictures, as the POV of the spacecraft mneans the objects will be seen in differnt lcoations to eath based planetarium programs. The Geminids have taken a hit not only from the Moon, but also the weather. Not only many Australian sites were clouded out, a lot of US sites were too. Despite the cloud Thomas Ashcroft got this fireball image. Over in Greece The Elisabeth Observatory got some images of lone meteors. The International Meteor Organisation Live Count isn't showing many meteors at the moment, but it might improve later. UPDATE: some nice images from Singapore. Did anyone see the minima of Algol? Attention Smiley Conjunction photographers! Did you image C/P 2003 K2? Comet Al has noticed that comet C/P 2003 K2 (Christensen), which he just recovered in images from the STEREO spacecraft, was within 8 degrees of the "Smiley Fritz" Conjunction on December 1. As many people were photographing this event, there is a possibility that someone caught the comet while imaging the conjunction. Neither my nor Comet Al's images went deep enough to get the comet, but some of you more dedicated astrophotographers may have got it. So could you please peruse your images of the Smiley Fritz conjunction and look for the comet? 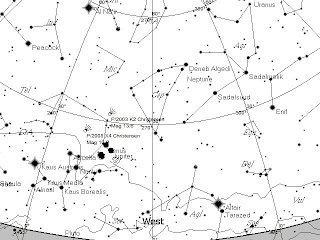 The chart on the left shows the location of the comet at nautical twilight (9:20 pm ACST) on December 1. Astute readers will notice TWO comets. The one labeled 2003 K2 is the OLD position, the one labeled 2008 X4 is the same comet, but with orbital elements worked out from Comet Al's obsevations. Naturally, the comet image should be around where X4 is. 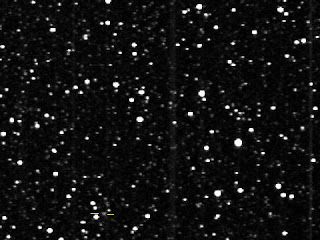 The fuzzy dot bracketed by the yellow lines at the bottom of this image is at the time of writing has been identified as comet P/2003 K2 (Christensen) . Our own Comet Al discovered the comet on images from the STEREO SECCHI instruments. Originally it looked like this was going to be the first non-Kreutz comet discovered from STEREO spacecraft data. Unfortunately, this was not to be, but it was the next best thing. Some excellent sleuthing by Rainer Kracht and Maik Meyer suggested that this was the previously discovered periodic comet 2003 K2, which had not been recovered since its discovery. Ranier derived orbital elements and Maik recognised them as P/2003 K2. Brian Marsden has now confirmed this identification. This is the first time a comet has been recovered (as opposed to discovered) from STEREO data. Congratulations Comet Al and all the stereohunter folks for this fantastic recovery. You can get an AVI (680K) of the comet here, and an animated GIF (530K) here. The comet is pretty hard to observe from ground based observatories at the moment, disappearing into the twilight. But in January it will become visible to telescopes. See here for orbital elements and predictions. Why is recovery important? The orbital elements of a newly discovered comet can be imprecise, especially if it can only be observed for a short part of its path. So there may be some uncertainty in predicting when and where a new comet will return. In the case of P/2003 K2 (Christensen) the orbit was uncertain by about 1 month, so picking it up again was not trivial. Looking for a faint object when you can be several telescope fields away from its real position can be a pain. Congratulations again Comet Al! Apparently the Full Moon tonight (Friday December 12) will be the biggest this year. Go out and take a look! If you miss out on the minima of Algol, you might like to follow Algol, and other variable stars, using the images from the STEREO spacecraft. This beautiful photo of the Venus, Moon, Jupiter conjunction (otherwise known as the "Night of the Smiley Face Fritz") was taken by reader James Fricker of Victoria. You will need to click on the image and enlarge it to see Jupiter though. This image emphasises that you don't need fancy equipment to take great images of the sky. This was taken with a Konica-Minolta Dimage Z10 3.2M pixel, hand held with short exposure. James must have very steady hands, if I had done something like that the image would be all over the shop. So let this photo be an inspiration to you, and have a go at imaging some of the upcoming astronomical events of 2009 (like a partial eclipse of the Sun and Moon, and a nice morning conjunction, more info later). The northern horizon as seen from about Sydney's latitude, at 9:35 pm AEDST on 16 December. The brightness of Algol at maximum and that of surrounding star for comparison are shown in the black and white map. Click on the images to enlarge. Algol is one of the classic variable stars, unlike the red giant Mira which changes brightness through its expansion and contraction, Algol is an eclipsing binary. The bright star has a dimmer companion which passes in front of it just short of every three days causing the star to appear to "blink" (if dimming over 5 hours is a blink). No wonder the stars name means ‘Blinking Demon”. 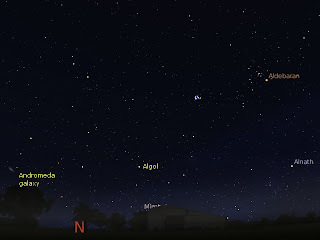 Algol is very difficult to see from the southern hemisphere, it is below the horizon for a good chunk of the year, and even when it is visible, it is very low to the horizon. This means the times to observe Algol dim are few from the southern hemisphere. However, in the next week there are two good opportunities to see Algol "blink", on the 14th (13th in WA) and 16th of December. Algols first good minima is on 13:55 Universal Time on the 13th, in Western Australia this is 10:55 pm AWSDST, on the 13th, in Central and eastern Australia this is on the morning of the 14th at 00:25 am ACDST and 00:55 am AEDST. 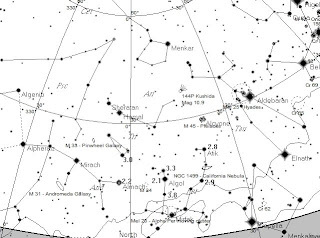 At this time however, Algol is only around a handspan and a half above the northern horizon in Sydney (less in places south, more in places north) , so you will need a fairly level, clear horizon to see Algol (see chart to the left, which if for Sydney at 00:55 am AEDST). In Perth Algol is around two and a half handspans above the horizon and almost due north, so WA folks will have better views. This is the night of the Geminids, so if you are up watching for meteors, you can watch Algol dim and brighten. 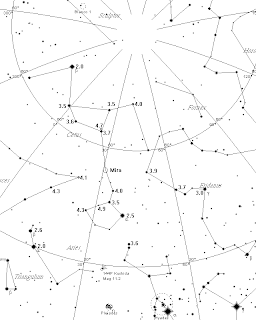 The next minima is on the 16th at 10:44 UT which is 7: 44 pm AWDST in WA, before sunset. So WA folks miss out. However, in Central and Eastern states it is 9:14 pm ACDST (after civil twilight) and 9:44 pm AEDST (astronomical twilight). The charts for this are at the top of the page. At this time you will miss the dimming, but can easily watch Algol return to brightness. The total "blink" time (from start of dimming to minimum brightness then back to full brightness) is 10 hours, but you can easily see Algol rapidly change in brightness over an hour or so. At minimum, Algol is as bright as the dim star immediatley above it. You can use the magnitudes shown in the finder chart above to keep track of Algols dimming or rise as outlined in the post about Mira. So when you are out and about, keep and eye on Algol and you may see it blink! I keep on forgetting to remind people of the Jodcast. One of the great podcasts of astronomy, this one has extrasolar planets, fuzziness of gravitational wave detectors and a great interview. Carnival of Space #82, the videotastic edition, is here. In a first ever for our carnival, host Discovery Space Disco writer David Mosher has made a video blog of the carnival. Grab some pop-corn, rush over, put your feet up and watch (oh yes, there is ordinary writing as well for those who can't access video. The view of the north eastern horizon around 1 am daylight saving time as seen from the southern hemisphere. The radiant, the point where the meteors appear to come from, is marked with a cross. The meteor numbers are illustrative, you are unlikely to see more than one at a time. (click on chart to enlarge it). The Geminids are a fairly reliable meteor shower, with rates of about a meteor per minute. Unfortunately, this is a bad year for Geminids. The peak is predicted to be around 10.00 am (AEST) on the 14th, during daylight in Australia. As well, the nearly full Moon is not far from the radiant, so you are likely to be only able to see the relatively rare very brightest meteors. The radiant doesn't rise until just before midnight (daylight saving time) in most of Australia, so you will still have to disturb your sleep for this one. 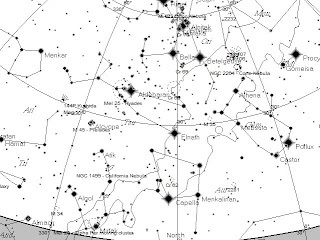 At 1.00 am in the morning AEDST (midnight, AEST) Castor (alpha Geminorum) is about two handspans above the horizon and 10 handspans to the left of due north. Pollux, the other twin, is less than a handspan to the left again. The radiant is just below Pollux (see diagram). A black and white printable spotters map is here. Unlike the Leonids, where there is a very narrow peak of high activity, the Geminids have a broad peak and will show good activity well before and after the peak, and on the day before and after. While the glow of the Moon will drown out all but the brightest meteors, it will still be worthwhile watching the occasional beauty shoot across the sky. Watching Mira Brighten - Record Your Observations. The star Mira shines at roughly magnitude 4.2 in this image of the sky taken on 28 November 2008 (click to enlarge, otherwise the stars are a bit to dim to see). While most stars seem to shine with a constant brightness, there are some that undergo regular, dramatic change in brightness. Few of these are visible to the unaided eye, but two classics are Mira and Algol. Algol is a bit hard for most of us in the southern hemisphere, but Mira is very easy, and Mira (omicron ceti), a star in the constellation of Cetus the whale, is a long period pulsating red giant and changes brightness from below naked eye visibility to a peak of round magnitude 2 (roughly as bright as gamma Crucis in the Southern Cross) in around 330 days. Mira will peak magnitude later this December, and will brighten visibly over this month. The image above shows Mira on 28 November, when it was around magnitude 4.2, as of last night it was around magnitude 3.9. At the beginning of November I couldn't see it at all, so it was probably magnitude 5.0. Here's a activity for the next few weeks, record the changes in Mira's brightness. This will be difficult for the next few days, as the bright Moon will be nearly on you o f Mira, making the stars hard to see. However, after a few days you will be able to see the stars with reasonable ease. But I don't know anything about magnitudes, you say. Estimating magnitudes is relatively easy, the image to the left is a chart of Cetus with Miras position marked, and the surrounding stars labelled with their magnitude. To estimate the magnitude of Mira, compare it to the surrounding stars. Is it brighter than a star labelled 3.5, and is it dimmer than a star labelled 3.0? then its magnitude is somewhere around 3.2-3.3. Click on the chart to enlarge it and print it out. Use a torch with red cellophane wrapped around the business end to view it while star gazing (to keep your night vision), and wait for at least 5 minutes outside for your eyes to dark adapt. Cetus is just above the easily recognized Taurus above the northern horizon in the early evening. This would be an ideal activity for kids. In 1572 astronomer Tycho Brahe saw a new star burst into the sky. This "New Star", Supernova 1572, changed how we say the heavens, and help sweep away the Aristotelian models of the Universe. This supernova was classified as a type Ia. However, there has been some doubt about this classification, as naturally enough astronomers were not able to directly measure the Supernovas spectrum. Now, over 400 years later, astronomers have been able to measure this spectrum from light echoes reflected from dust clouds and confirm it was a type Ia supernova. Once the light of the supernova swept past earth back in 1572, it kept going. When it hit dust or gas, some of this light was reflected back to us. These (very) dim reflections are a sort of time machine that allow us to "watch" the supernova as it happened all those centuries ago and measure its spectrum. Light echoes have been used before to identify supernova (see here and here for more detailed explanations and videos. But this is the first time such a historic supernova has been seen. This study reports an optical spectrum of Tycho Brahe's supernova near maximum brightness, obtained from a scattered-light echo more than four centuries after the direct light of the explosion swept past Earth. It is found that SN 1572 belongs to the majority class of normal type Ia supernovae. You may remember back in late November a massive fireball was seen over Alberta Canada. Various stunning videos of the fall circulated the intertubes. At the time, one on my neighbours wondered if fragments of the meteor would be found. I was rather sceptical, meteor fragments can be rather small and hard to find. However, I was wrong, and lots of fragments of the meteor have been recovered. See Bruce McCurdy's web page for some fantastic photos (and more videos) of the meteor. Getting over the "Night of the Smiley Fritz" yet. This composite image is not the starship enterprise seen from above, but a series of 4 shots taken half an hour apart. The shots were aligned using the layer and difference functions of the Gimp, then the layers screened to show all the planets. I aligned the images on the Moon, Rather than Venus and Jupiter as a) the Moon smear was very unaesthetic, and didn't give a proper feel for how much it moved between shots and b) Venus is actually moving as well, quite slowly compared to the Moon, but fast enough that you can see the Jupiter and Venus tracks are different (allowing also for the fact that the Venus images are more over exposed than Jupiter). Ideally I would have aligned against a "fixed star" but they were too dim in these images. So there you have it, the Moon does move! And the Moon, Venus and Jupiter are still lovely. This lovely image is from Tony Tavaglia of Otago, New Zealand. He got socked in with bad weather during the "Night of the Smiley Fritz", but managed to get this shot tonight. I like the colours of the deepening twilight. The "Smiley Face" conjunction may be over, but the pattern of the Moon, Venus and Jupiter tonight was superb (as always, click to enlarge). There was an iridium Flare that went over the conjunction, but it was disappointingly dim. It's fantastic so many people got to the the "Smiley Face Conjunction", the line-up of Venus, Jupiter and the Moon on December 1, 2008. Especially since we won't see another one like it until around 2036 or so. And it's good that people who didn't get to see it could share in it through the photots. Many readers left links to their own images. I'm promoting these links in this post, so they are not missed by casual readers. First up is Comet Al's image of the lineup, where you can see the Moons of Jupiter. More images of the Venus, Jupiter, Moon Conjunction. Well, one image only, but a nice one of the line-up and Earthshine. 6:22 pm ACDST: Klatting CLOUD! 7:09 pm ACDST: Still Klatting CLOUD! But there was a sundog in the cloud, making it rather pretty. Then my camera battery went flat (faceplam). I was planning to see if I could get shots of Venus, the Moon and Jupiter in daylight, but that seems doomed. 7:32 pm ACDST: The clouds are rather nice, stark white fluffy horsetails against a vibrant blue sky streaked with light and shade from the setting Sun. EXCEPT THEY ARE RIGHT ON TOP OF THE MOON AND VENUS!!!! 8:32 pm ACDST: The cloud has parted a fair bit, and a large chunk of sky is crystal clear, the triple line-up is amazing, I fire off a series of shots and close ups. Maybe some will work. I show the boys before sending them off to bed "It's a smiley face" says Middle One. 9:00 pm ACDST: The cloud is back again, but the Moon and planets glow fuzzily through the cloud. 9:30 pm - 10:00 pm ACDST: The cloud has gone away, I take some shots, then set up the small telescope and have a look. The planets jitter and jiggle in the heat haze, but I can see the Moons of Jupiter clearly, and the bands of colour even though Jupiter shimmies and shakes. See Comet Al's images of the line-up, the Moons of jupiter are clearly visible(can't see them at all in mine). Venus is clearly waning gibbous, and shines so bright in the scope that it almost hurts. The Moons craters shiver as if they are underwater. The best views were with the binoculars though, all the participanst were together in the binocular field, and the warm glow of the earthshine on the Moon was clearly seen, as well as the craters of the Moon. The Bettdeckererschnappender weisle came back from her School Council meeting and said that everyone had gone out to see the lineup. They called it the "Smiley Fritz" Moon. Finally I packed up the scope and binoculars and went back inside, tired but happy. The western horizon at around one and a half hours after sunset on Monday, December 1, 2008 as seen from the southern hemisphere. 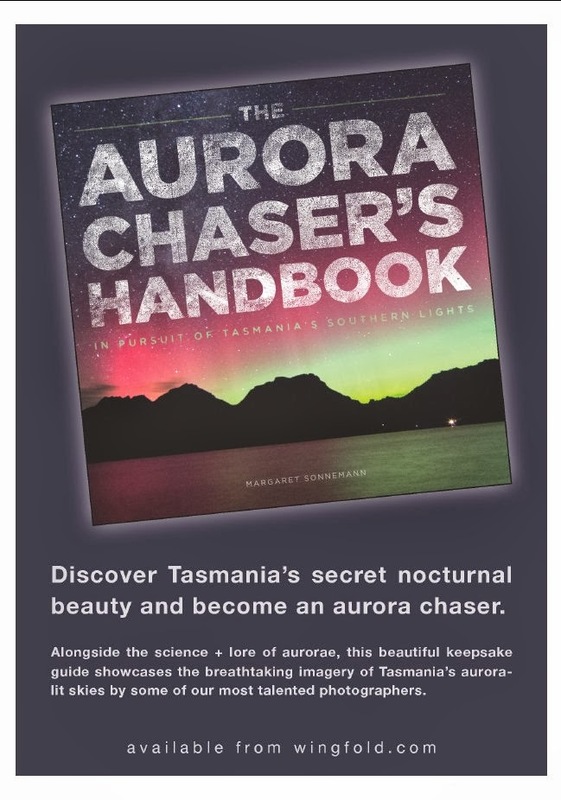 The December issue of Southern Skywatch is now up. We have a terrific line-up of Venus, Jupiter and the Moon, the Geminid Meteor shower, the maximum of the variable star Mira and finish the month off with an occultation of Jupiter.